Neurosurgery is one of the most competitive fields in medicine, and getting accepted into neurosurgery residency programs can be challenging for any medical student. In order to get accepted into these programs you will need to submit an outstanding application and memorable personal statement that will get the attention of an admissions board, proving you are an ideal candidate for one of their coveted program positions. The best neurosurgery residency personal statements will get the attention of admissions counselors and show them your potential for success in their program. However, creating the perfect statement can be challenging for any individual, which is why we offer professional neurosurgery residency personal statement writing services. University of Miami: this program will allow you to gain experience in the specific areas in which you have an interest. Yale University School of Medicine: an Ivy League school that will provide the opportunity to practice as well as conduct research in your specialty. University of South Florida Morsani College of Medicine: this 7 year program accepts just 2 residents each year so apply early to boost your chance of success. University of Pittsburgh: the residency has been around for 80 years and accept 4 residents each year onto the 7 year program. University of California San Francisco: if you want to be at the center of groundbreaking research then this is the residency for you. Writing a personal statement for residency programs in neurosurgery can present any student with challenges as there are so many things that you must include in your statement to ensure it is a success. The best neurosurgery residency programs will be looking for personal statements that depict who you are as a person, what life experiences you have and why you would be an ideal candidate in their particular program. The personal statement should also be interesting to read and leave a lasting impression on the admissions boards so they will remember your statement in the future. Of course it should also show your professionalism, your command over the English language and your ability to create an error-free document. What Should and Should Not Be in Your Neurosurgery Personal Statement? What led you to wanting a career in neurosurgery? How have you pursued this interest to date? What will make you a good neurosurgeon? Why have you applied to this program above any other? Don’t discuss anything that is covered in other areas of your application. Don’t complain about past programs, tutors, or anything else. Don’t make excuses for any issues with your application. We know that there are many things that must be included in a quality personal statement for your neurosurgery residency application. Fortunately for medical students looking for help with these statements, we have a team of professionally trained writers who can create attention-grabbing personal statements just for you. Our writers are not only professionals within their own field but they also understand the competitive medical world and know what residency admission boards expect from their applicant’s personal statements and they can create the ideal, individualized personal statement for any medical student looking to make an impression on a neurosurgery admissions board. Since the neurosurgery residency programs are so competitive, the admissions boards must look through numerous similar applications and try to find candidates the stand out. However standing out from such a competitive crowd can be a challenge. We will always guarantee to deliver your personal statement for neurology to you on time. We guarantee that your writing will be unique and free from errors: statements are provided free proofreading and delivered with a plagiarism report. We guarantee full confidentiality through our very affordable help. Your personal statement for neurosurgery is provided with a full satisfaction money back guarantee. Additionally, you can read some tips on how to create a perfect LoR and see a residency recommendation letter sample. 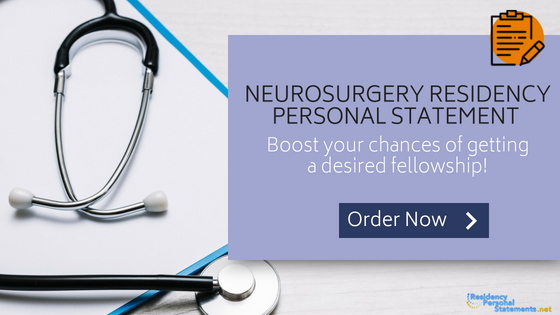 Make your neurosurgery personal statement outstanding and get your application ranked for the Match with our professional and effective services.